This is a silver denier of the Archbishop of Lyon. It is dated from the mid 12th to early 13th century. 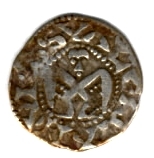 This coin has an interesting crucifix on the obverse with a "foot" to indicate the "L" from Lyon. The obverse legend reads +PRIMASEDES with the reverse legend +GALLIARV surrounding a short cross. Read together, the legend boasts that Lyon was the first see (bishopric) of the Church in France (PRIMA - first, SEDES - see, GALLIARV - Gaul -France). The dark color of this coin is actually a thick coating of tarnish (patina) which preserves the coin from further oxidation. In a comparison of the coins on this site, this coin is in the best condition of the lot and would grade at least VF (Very Fine) to EF (Extra Fine). The only better grade after EF is FDC (Fleur de Coin), also termed "Mint State" or uncirculated.